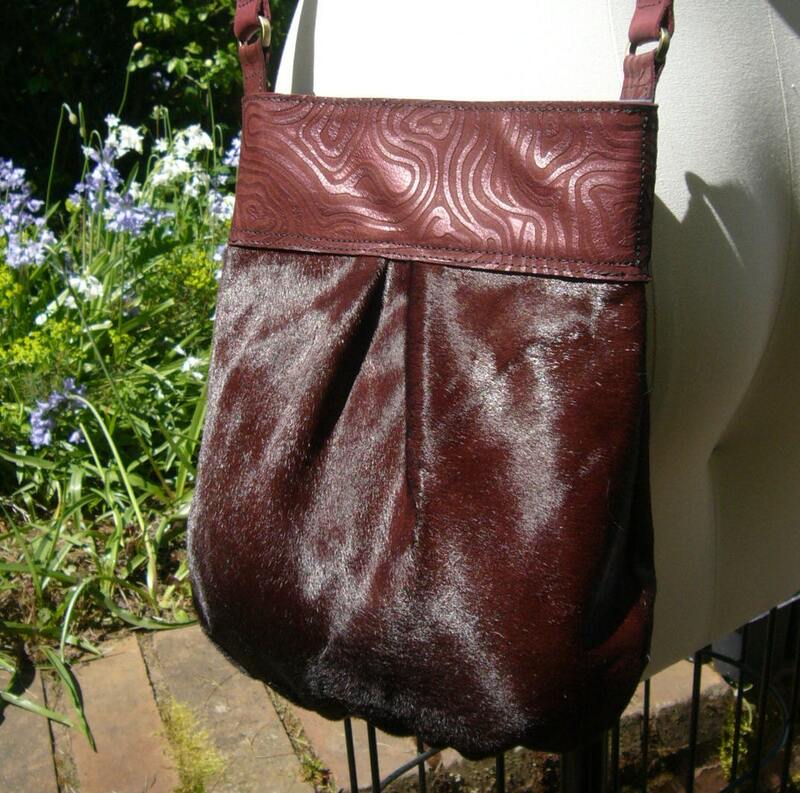 This is a one of a kind small leather purse made from a very unique & soft merlot colored "pony" (hair on hide calfskin) and a swirl pattern embossed cowhide and top grain cowhide strap. 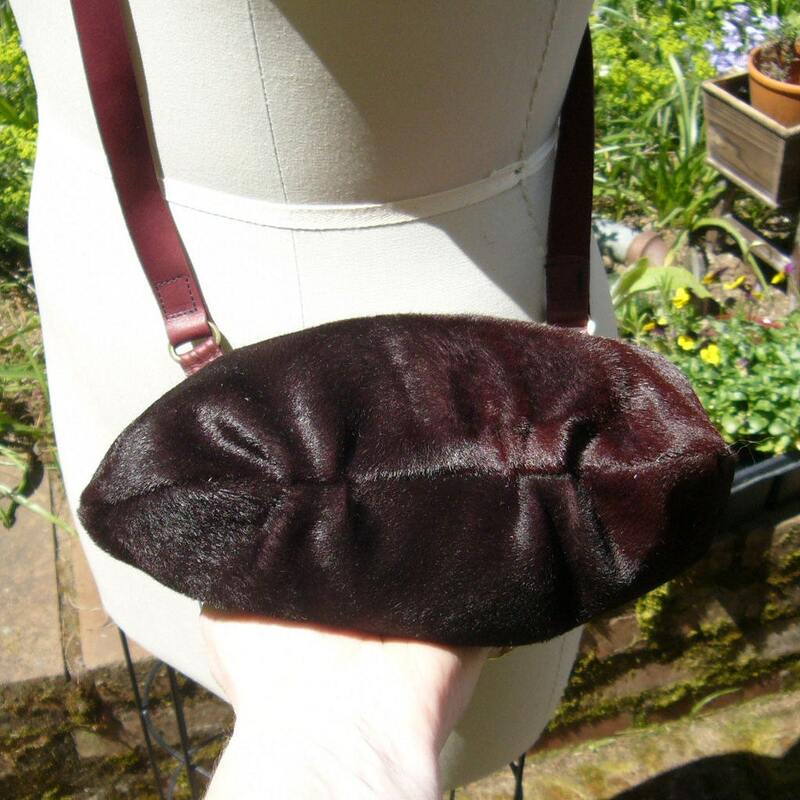 I cut the hide to take advantage of the natural ombre effect of the dyed calfskin, so it it darker at the base than the top. It is also a fine hair that is silky, and the whole hide is super soft and supple, and feels wonderful to the hand--and don't be surprised if others ask if they can "pet" your bag! 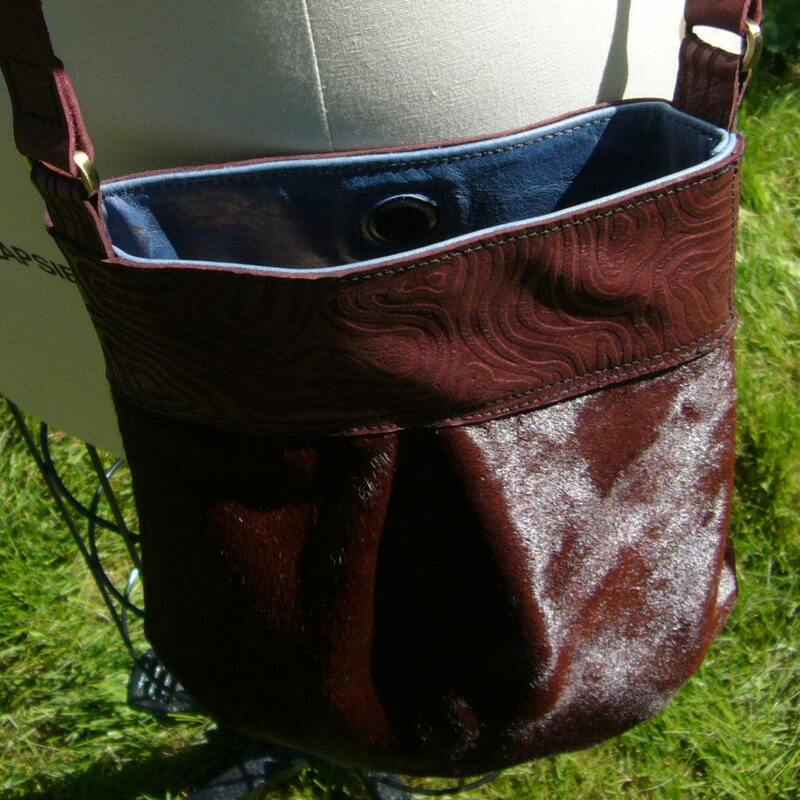 The inside of the bag body is unlined to take advantage of the super soft sueded side of the calfskin that is a wine color, since the dye permeates through the entire thickness of the hide (vs. just a top surface color). Even though this is soft, it is very tough and durable. 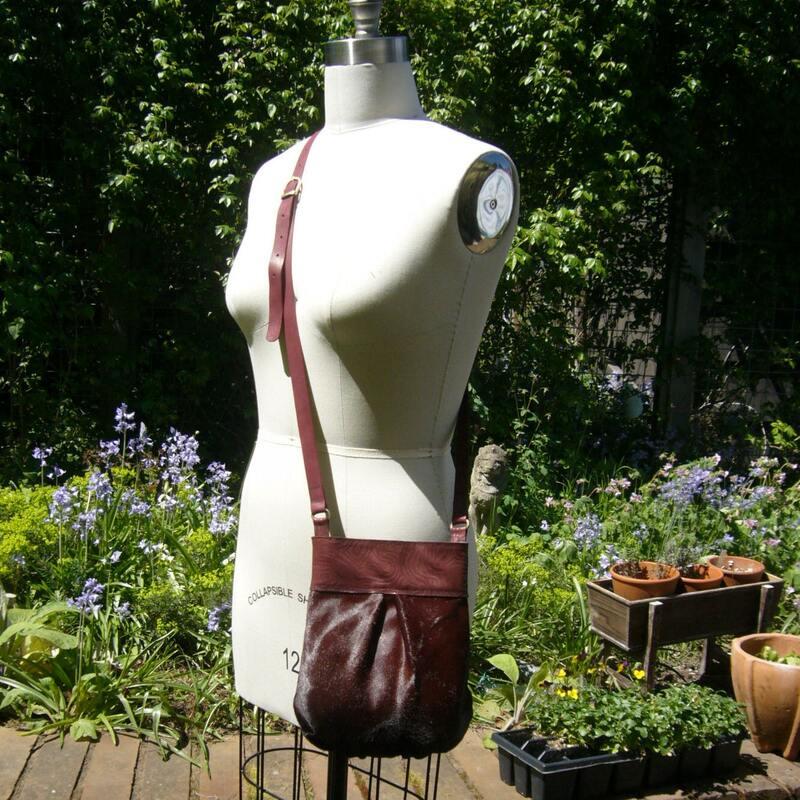 The body of the bag when flattened is about 9" across and over 9" high w/ top band. The body is pleated at the top & bottom to create a pouch shape that hold way more than it looks like it can--about 6x6x4 in volume, and since it's not stiff, can accommodate a variety of shaped items. The embossed cowhide top band (7 1/2" x 2" high) is lined with a blue lambskin, and closes via sewn-in low profile magnetic snap. The opening is big enough for a standard paper back book, or even a small e-reader or tablet. 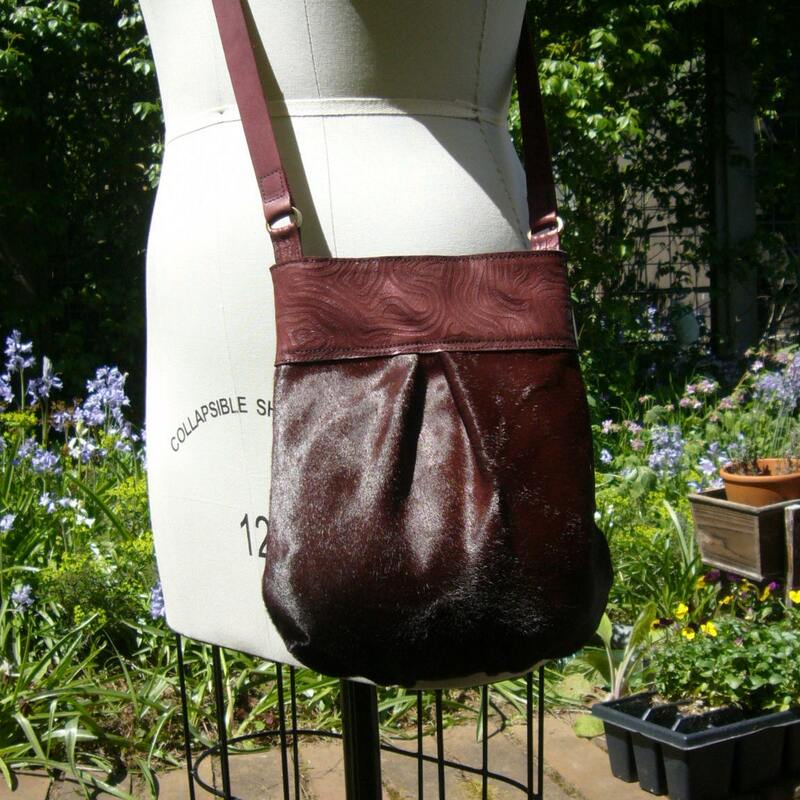 The cross-body strap is wine colored top grain smooth cowhide, about 48" long (for average height/size), and can be adjusted via a brass buckle. It connects to a small antique brass oval ring, which connects to the bag by a small strap of the embossed leather that is folded into and glued and double stitched between the top band & facing. If you want the strap longer or shorter, please let me know when you order.